Ice cream, a frozen confection containing at least 10 percent milkfat, by law – is the quintessential summer treat and a favorite for all ages. We’re partial to homemade, but also enjoy tasting quality brands from local and regional options to artisanal varieties from around the country. To celebrate our own love of ice cream, we’re sharing some of our favorite ice cream resources in addition to several recipes. An absolutely trustworthy source for homemade ice cream recipes is the fabulous and creative David Leibovitz. His book, The Perfect Scoop, is a must-have for those interested in the amazing goodness that is homemade ice cream. For an enticing list of ice cream and frozen dessert recipes to inspire you, check out National Ice Cream Month ideas from Annie’s Eats and Brown Eyed Baker. Though it falls under “frozen treat” as opposed to a true ice cream, we recently made an incredible sorbet – no ice cream maker necessary! Pit and freeze cherries. Heat water and sugar until sugar dissolves, creating simple syrup. Remove from heat. 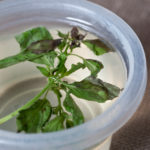 Pour into container and add two sprigs of lemon basil. Let steep. 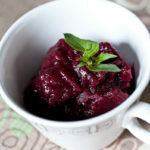 In blender, puree cherries, 4 tablespoons simple syrup and lime juice. Freeze to desired consistency. What’s your all-time favorite ice cream? Not a fan of ice cream? Do you prefer a sorbet or other frozen treat? Oh my goodness! You read my mind. I fell prey to the Whole Foods cherry sale last Friday and I have little red globes coming out my ears. I’ve got two cherry recipes working for this week. 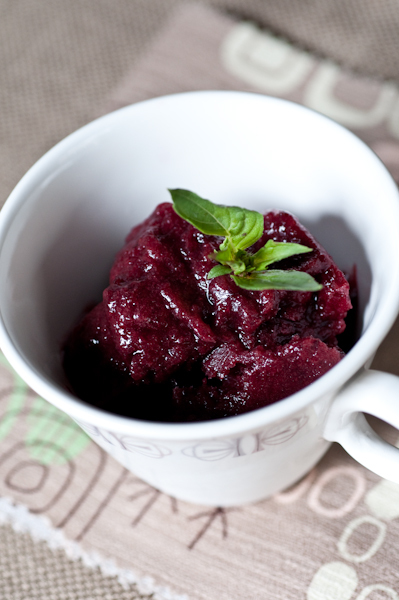 Perhaps this lovely looking sorbet could round out the remaining fruit? Britt – You must make this! I used some cherries that were on their way to the Big Cherry Pit in the Sky. So glad I rescued them. You’re really going to enjoy the sorbet.